I just went back tonight… a Saturday, during what should have been “peak” hours the food and experience wasn’t good at all. Service was okay, but man that food was terrible. Disclaimer: The following review was for the soft opening. But why this in particular? One of the things that I enjoy the most when visiting my friends in Cali, NY, or even Las Vegas for that matter, is going out late at night to an izakaya with a relatively large group of friends, drinking an obscene amount of beer and sake, playing drinking games, and eating a wide assortment of tasty “tapas” styled dishes which I can share with everyone on the table. It’s just fun. I’m not an expert on Japanese food, I’ve just always wanted to be able to do the same thing in Austin… and now thanks to this place I can. 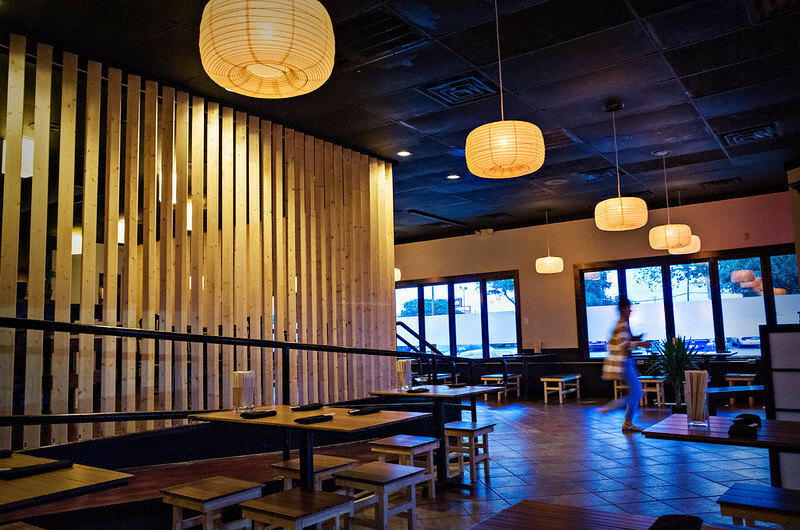 Even with the influx of new Japanese places here in Austin, The Dojo is unique since it closes at 3AM on weekends and 2AM on other days. That’s pretty awesome. First thing that stands out when you walk in is the size of the place. It’s really large and spacious, which is sort of different than the other izakayas that I’ve been to. When I first found out they were going to have teppanyaki (Benhihana style with the chef that does all the knife tricks) I was VERY worried. It seems like they were trying to attempt way too many things at the same time. But the teppanyaki tables are hidden away from the main restaurant, which is nice since having that in the middle of the restaurant would have been an annoying distraction for any of the other tables not doing it. They have a really inviting bar in the middle of the restaurant. I think it’s perfect for when you’re just going with 1 other person. I didn’t see bar hooks to put your bags (key detail in my opinion), but oddly enough… there are electric outlets at almost every other seat which means you can probably camp out here with your ipad or laptop for a quite a while. SO is this just another place trying to jump on the ramen bandwagon? Lets see. The noodles seemed inconsistent among everyone at my table. Mine were overcooked. I think they made a good choice with the noodles… just need to work on the timing. Egg was undercooked and had mushy whites in the center. I don’t think the eggs here will ever be as good as Tatsuya’s since they don’t have the chashu juice to cook theirs in, but at least they could be well cooked. 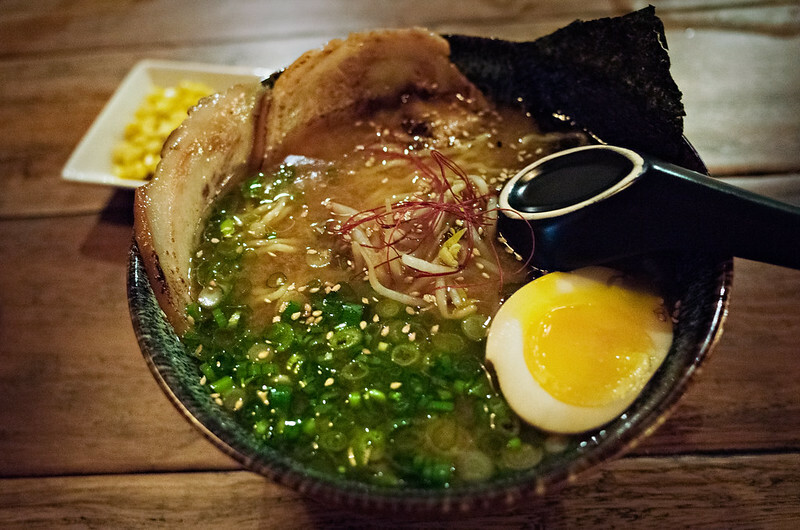 One could say that the broth lacks flavor in comparison to Tatsuya and even Daruma(which is considered to be light), but I think it was acceptable for a Miso broth, you have to keep in mind that Tatsuya’s miso ramen is actually a Tonkotsu broth with miso in it. I like that Austin is finally reaching a point where we can have a choice for different styles of Ramen. If you don’t like the intense fattiness of Tatsuya’s tonkotsu broth, you can go to either The Dojo or Daruma if you still want a noodle soup that has interesting toppings and playfulness. The chashu pork was really good, very similar to Totto in NY. I think the temperatures in the ramen need to be tweaked so that the toppings, cold egg, and hot ramen work together, as it stands right now… they’re totally off. I don’t know how this is done, but some other places(tatsuya and ramen shops in other cities) have figured it out so it’s possible. It’s also worth noting that I Daruma also lacks this subtle control of temperature. I think the broth was a tad too hot at first, but after the broth cooled down a bit it was tasted quite amazing with the corn. There are 2 ramen sizes which is convenient if you’re going to try more stuff. The small comes with 1 piece of chashu, and the large has 2. Just don’t be a pansy and get the large bowl on your first visit to see what it’s all about. I would recommend adding corn ontop. It’s kind of weird that Kome’s ramen hasn’t gotten better… despite them owning Daruma as well. Hmm. Also I haven’t been to any of the places in Cedar Park yet. 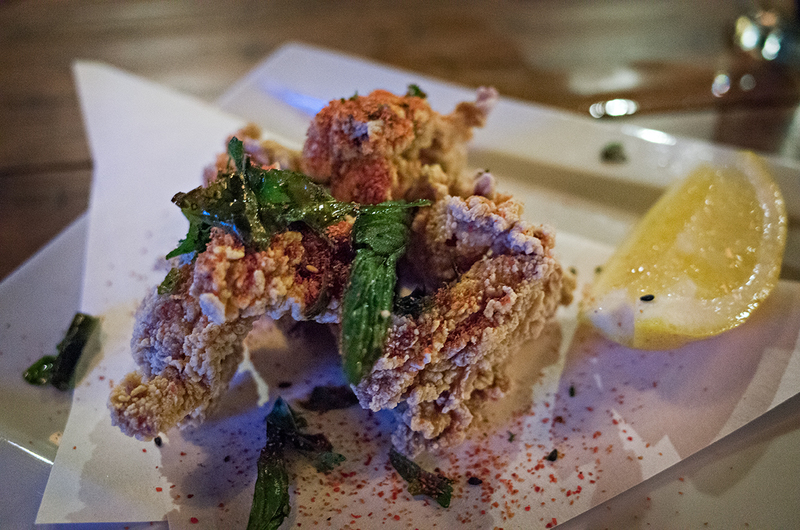 I actually like The Dojo’s version of fried chicken… more than East Side Kings (blasphemy I know). 1 order has enough pieces so that 5 people can each have 1 piece. -Yaki Tsukune – Juicy chicken meat balls with a quail egg, quite nice, but perhaps it can have more flavor and be easier to share with more people. -Fried potato croquette – you get 2 of these for 3 bucks! 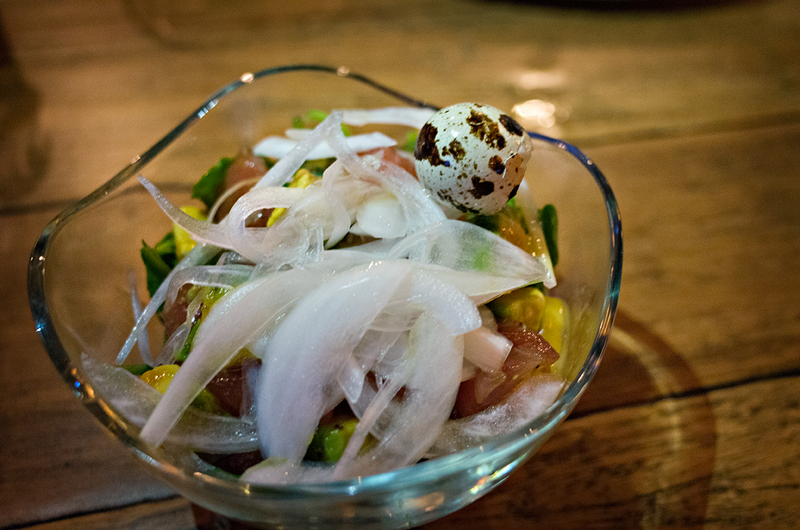 A bowl of avo and fresh tuna mixed up, quite an honest portion. Could be made better with some crispy rice. -Assorted Tempura’d Vegetables(forgot name) – A variety of tempura’d veggies. I really like that they included shishito peppers into the mix. -Cocktails – I actually enjoyed the cucumber drink and the yopuri lemon. I don’t know about the sugar rim on the yopuri cocktail, but the kick of ginger along with the lemon was very pleasant. -Kimchi Fried Rice – I actually thought this packed a lot of flavor due to the charred bits, but for the sake of trusting the Korean girl sitting at my table who knows more about such things, I’ll have to default to her opinion that it wasn’t good. -Drunken Clams – Had an intense sake flavor, but I’m not sure about this dish being on the menu. Didn’t seem substantial enough, and might possibly be too much effort to produce for such little yield. -Pitchers of beer: I love that the beer comes in a chilled glass, but ordering it by the bottle gets a little expensive and tedious in my opinion. The convivial spirit of the place would be improved if people got either larger mugs of beer or pitchers. -Beer selection: While they have all the standard Japanese import beer, I think they should explore local options. Perhaps ABW Peacemaker, Live Oak Hefewizen, and 512 Wit, Ommegang (from NY) Hennepin, and even Rogness Yogi(for its gingery flavor) should be added to the list. 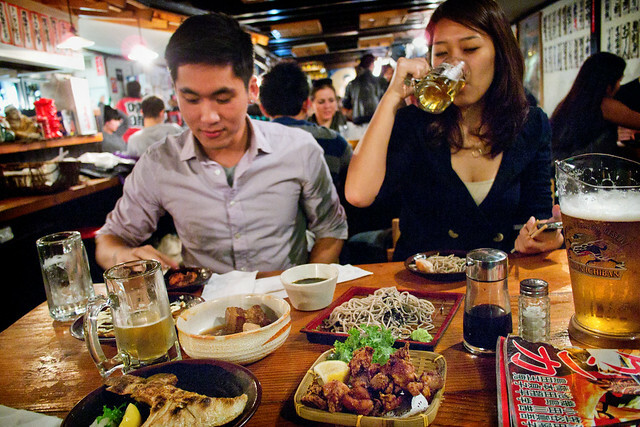 -Dishes that are easier to share amongst 4~ people – Perhaps a yakitori sampler? -More daring dishes – I want to see heart, liver… that stuff Anthony Bourdain would want to come in and eat. Ya know? I really want to come in and find dishes such as collar bone or more types of yakitori on the menu. I think Austin is ready to actually have the good stuff. -Ramen wait time – despite the restaurant being almost totally empty, our ramen took a long time to come out, and the quality was inconsistent among all of us. Sort of a warning sign. //Crazy Ideas that could make this place THE SPOT. -Beer tower: I know that it seems that I just want more beer… but yeah if they had that crazy glowing lamp beer tower that places such as Mad For Chicken has in NY. It could create quite the buzz. -Karaage bucket: Yeah. I know this is really what all of us want. Make it happen. -Cut the ramen entirely:. I know this sounds crazy, as they put a lot of work into the recipe. But if they just let go of this crazy time intensive dish and focused more on their other offerings, it would really help the restaurant. –Larger tables: I really want to see more 6-8 seaters… that sounds like a good time. Initially I thought there was no way a restaurant could handle teppanyaki, ramen, izakaya, and binchotan all at once… but The Dojo might be able to do it. I fear that they will run into a ton of problems as more people come into the restaurant, but I’m hopeful they’ll figure it out and do well in the future. This is a great place to go to with a party of about 4~ people (most tables are 4 seaters) and maybe even a great spot to go with just 1 friend in which case I recommend sitting at the bar. As for price this place isn’t cheap, but I feel like it’s of good value. Portion sizes are humble and honest. 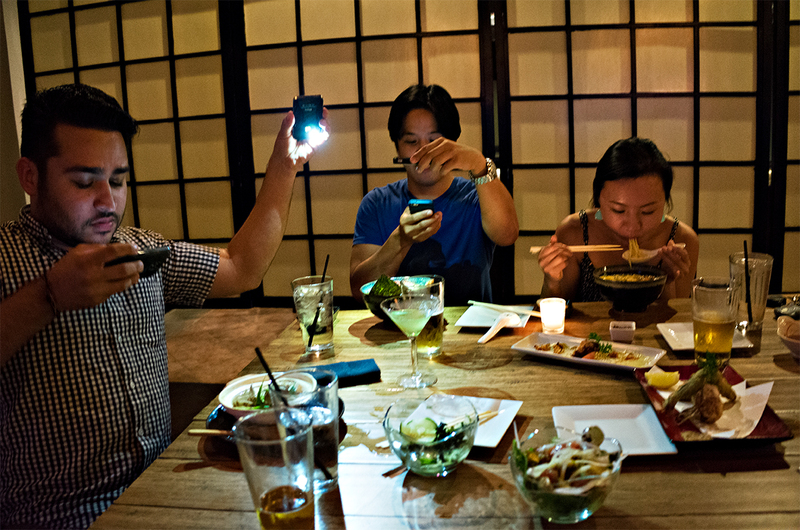 An average person would probably get 1-2 apps, 2 main dishes, and 2 drinks. Keep in mind that you should order in the spirit of sharing your dishes with the table. Eating and drinking here with friends then going to Pinballz Arcade or karaoke which are really close by to the place would probably be an ideal night for me!